earlier, it can be purchased in different widths, colors and finishes. It's important that the width purchased is sufficient to cover the plywood edge and the Formica. Installation is fairly simple. For the cabinet walls, I chose to start the t-molding at the back of the cabinet so that the start/stop seam would not be visible from the front of the cabinet. I used a rubber mallet to gently pound the t-molding into the slot that was previously created using the router. Once the t-molding is in place, it's not going to want to come out too easily (and it's probably a good idea to not remove it unless it's an emergency), so keep it fairly taut while pounding it in and move little by little. 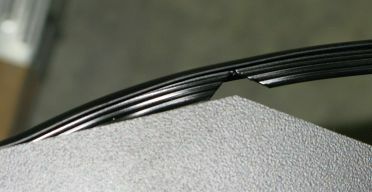 the molding has the center spine that goes in the slot, it will not bend around an outside corner. The trick is to use some snips to cut part of the spine off (being careful not to cut into the outside molding itself) so that it has enough of a gap to bend to the angle you need. inside width of the cabinet. I drilled holes in the plywood to match the mounting holes on the LCD monitor. I purposely made the mount so that the monitor would have a slight gap between it and the glass. Using trial and error, I was able to add washers to the monitor mounting screws (between the monitor and the mounting board) so that the monitor was sitting right up against the glass. 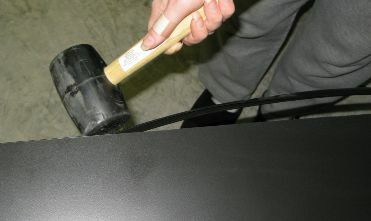 I then clamped the monitor board (with the monitor attached) to the blocks. Once everything was aligned, I drilled the holes through the blocks and monitor board and then used bolts with wingnuts to hold everything in place. I decided to put the on/off switch up on the top of the cabinet. I used a standard light switch that you would find in your house. I mounted it in a standard electrical box on the inside of the cabinet. This keeps the switch hidden from view (unless you're tall enough to see the top of the cabinet), but easily accessible. The switch is connected to and runs through a standard household plug that is at the bottom of the cabinet that is mounted on a shelf that sits about 8" off the bottom. This is then wired to the plug wire that goes out the back of the cabinet and to the wall. I don't have the computer in a case. Rather, I have the motherboard mounted to the underside of the shelf at the bottom of the cabinet. On the top of the shelf I have the hard drive (in a standard hard drive mount) and the power supply. I cut a round hole (about 3" diameter) in the back of the cabinet where the power supply is mounted. I covered this hole with a standard safety screen on the outside of the cabinet. This hole is for air flow/ventilation for the power supply. The power supply is mounted backward compared to how it would be in a computer case. It pulls in air from the back and exhausts it into the interior of the cabinet. At the top of the cabinet, the back side of the marquee area is angled. I used my table saw to cut a bunch of parallel slots in that board to create a vent for the cabinet. The idea is that the power supply will pull in cool fresh air from the bottom outside of the cabinet. 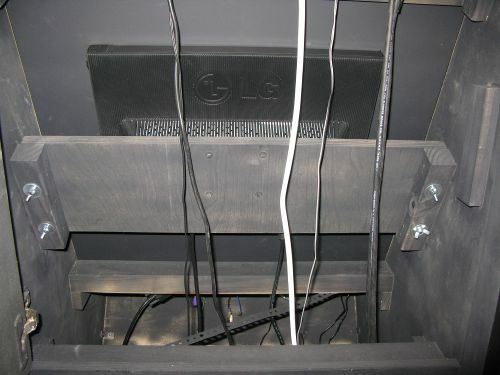 The warm exhaust air from the power supply, motherboard and monitor will all rise and exit the top slotted vent at the top.